It is almost time to go. I am wired and calm all at once, hoping that sleep will come more easily than last night. The last couple of days of preparation have been full and busy, both with adrenaline and emotions and final tinkerings, sortings and packings. I have been here before, many times on many different launches. I am happy that everything is as I would like it and need it, and confident that I am as ready as I shall ever be. I am the fittest that I have been for a couple of years. I am calm and excited at once, and ready for the journey home. The final days have been made all the more brilliant and grounded by having Lucy at my side. When my brain fogged over, she made decisions. When my temper frayed because too much was happening at once, she calmed me down. When my heart raced and things felt too excitable, she held me close and I listened to her breathe. I am looking forward to getting stuck in to the rowing, to pulling and pushing hard away from land and rowing towards home. I am grateful to everyone who has helped me get this far and to all who will be helping me get home safely and swiftly. Keep an eye on the tracker for my progress (and ocean knitting!) and stay tuned to this blog and Twitter for updates – a mix of written, pictorial and phone casts. You will be hearing from both me and the team as we head home. Thank you everyone for being a part of this journey. It is a team effort and I am grateful to all, whatever part they play. 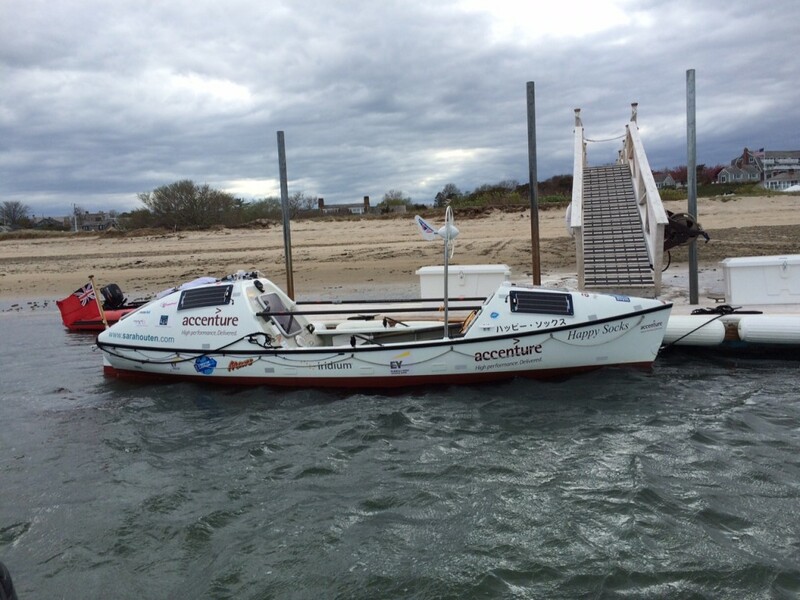 P.S Departing Chatham Bars Inn, Chatham, 0945 Thursday 14th May from the beachfront. Come along and say cheerio if you are nearby and read this before then! P.P.S Thanks to all my Chatham team… Alan and team at Ryders Cove Boatyard, Carol and Dave Penfield, the team at Chatham Health and Swim Club, Joyce Hutchings, Amy Latham, Ships Light, Grammy Roz and Bill Coleman, Pleasant Bay Community Boating, Cmdr Bill Burlin, John Dickson and Chatham Bars Inn. We will be thinking of you all the way home until you come under Tower Bridge. You are such an incredible person and such an admiration to all, you have met some wonderful folks on your travels, its so nice to know there are folks like them out there in this crazy mixed up world. Happy rowing, happy birthday too and happy whatever, hope the weather and winds will be kind to you, if anyone can do it you can. Love to you all and your team and thank you for all the pleasure your blogs have brought us as near to reality as possible. Wishing you fair winds and calm seas in this final leg of your incredible journey. There has been so much in between that moment we watched you kayak off from Tower Bridge days,weeks and months ago ; enduring so many different situations, experiencing mentally and physically everything thrown your way !!! and sending us back hundreds of wonderful (sometimes terrifying) photographs as we sit at our computers in awe at what you have achieved. I too want to say the same as above, to thank you and your team for all the pleasure your blogs have brought as near to reality as possible. Take care. Huge hugs all the way. Proud of all you’ve accomplished the past few years. You are one amazing lady and I’m happy I met you in Alaska! Good luck on this last leg of your amazing adventure! Keep your spirits high; your determination feeding your soul; your smile to share with all of us; and most importantly…..safe rowing and good health on your journey. I’ll look daily for your updates do I won’t miss a one! With Lucy to send you off and later to be one on the other side of the ocean to welcome you home…..how could you not be grinning from ear to ear with joy! Peace and love to you both. Still can’t get to grips with how far you have journeyed since we escorted you out of Freo on your adventure across the Indian Ocean. It has been very surreal following your adventures over these past few years and also very humbling. Wishing you every bit of good luck that the weather and currents prove to be a bit more sympathetic to your endeavours. Will be sending positive energy all along your route. Wishing you tail winds and calm seas in this final leg of your incredible journey. Good luck Sarah, The UK is warming up nicely for your arrival! Hope you enjoy the solitude for a while, we will be watching your progress! Good luck! Good luck and stay safe Sarah- a lot of folk are rooting for you!! Been following you closely all the way.. Thinking of you and wishing you well on this, the final stage of a wonderful adventure. Thinking of you & we will be following your progress all the way home. You & Happy Socks are a great combination! Can’t wait to cheer you in at Tower Bridge! Love to you & Lucy. Have been watching your entire expedition, Sarah, and wish you now a huge “Bon Voyage” as you tackle the last miles home. Safe journey! PS …and leave ‘the knitting’ to us landlubbers! Heres to a rowdy round of cheers for the send off. Neptune will appreciate another of rum. Safe rowing and I hope it will be short and sweet. Wow Sarah ! What an incredible journey….I hope this last piece of the circle goes smoothly for you . Good luck Sarah, enjoy the sea, I know it will be a special last-leg for you, what a great adventure and achievement. Awesome! Be safe. Can’t wair for the updates. Makes boring meetings very exciting. Bon Voyage, Sarah! Hugs to you, too, Lucy. As others have said here, if anyone can do this, it will be Sarah. She has seen and done and excelled at so many adventures already, this one will be fantastically successful, too. Stay cool, calm and collected even when the going gets rough. Draw strength and focus from the multitudes rooting for you, both the ones you know as well as the many you don’t but care for you just as much (myself included). Wish I could have waved you off. As always, walk in beauty. Hey Sarah, good on you. I’ve just had some friends paddle sea kayaks around South Georgia Island and have been thinking of you and sea kayak. In many ways I think your kayaking trip was the greater adventure. They say, “Wherever you go, there you are.” And where you are right now is in ALL our hearts. God’s speed to you and Happy Socks and may your seat forever slide smoothly.